Our big November cold burst has sent Seattle homeowners scrambling to prep their homes for winter. In our previous posts we discussed preparing storm drains, furnaces, windows and doors. But did you know that your hot water heater needs winter checking too? Fox’s expert plumbers advise that a simple do-it-yourself check could save you from a disaster as winter progresses. Why Do Tank Water Heaters Tend to Burst in Winter? December is best known for holidays and entertaining, however it is also the prime month when hot water heaters fail. 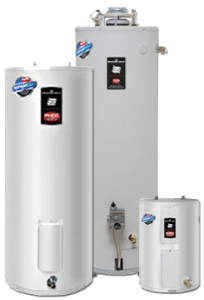 Hot water heaters consistently wear down over time, and the month that they give up and leak or burst may be impacted by colder than normal outside temperatures. As your hot water heater tank uses up the hot water that it’s storing, it pulls in new cold water to heat. That water is coming from outside so it’s affected by the temperature around it. Winter water enters the house at a much lower temperature than in summer. This pushes your tank to work harder and longer to get that cold water up to your heat setting. If the tank is in an unheated garage, it is also fighting the surrounding air to keep that water hot, which makes it run longer. Additionally, the difference in temperature between the hot water at the top of the tank and new cold water coming in at the bottom is now greater, causing extra flexing of the tank itself. Combine that with greater use from holidays, and an old tank with brittle, rusted or worn parts may not be able to take it. Having a water heater burst is not the holiday gift any of us have on our wish list. Take these 3 steps to check your water heater, and call a Fox Plumber if you have any questions or concerns. Examine the water heater for signs of rust or leaking. This could be an early warning of things to come. Look at the age of the water heater. The installation date will be written on it, as will any service dates or repairs. They are only designed to last between 8-12 years depending on the model, and that is with some maintenance. Do a little maintenance to help it stay healthy. Drain and remove sediment, or your water heater may be aging more quickly. 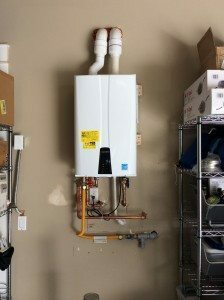 Have a tankless? Most indoor tankless water heaters don’t store water and won’t be affected by these issues. (They do still require maintenance to run properly.) If you have an outdoor tankless water heater, be sure to insulate the pipes around it. Call Fox if you have an outdoor tankless water heater and want to know more about winterizing.